This is wery interasting! Looks like you are a expert in the feald. Hope you dont mind a few questions. I am digging a cellar in the sandstone under the greenhouse, it will consist of 4 rooms. One for drying meet products like salami and persutto (the only one with hidroinsulation and ventilation to acheave ~60% humidity), one for preserveing harvested goods like potatoes, carrots, beets…, one for wine and beer ageing and one for mushrooms. Now, all rooms exept the meat cureing one will have 95% humidity. Is this too much for mushrooms? I se you use a lot of ventilation. Is this only for heat? My cellar will be about 12c year round. I see you grow a voriety of the button mushrom that grows wild here. The ones with black/purple bottoms. They are wery tasty and grow larger thain normal white buttom mushrooms. I have collected spores from them for later use. This is fantastic build, I love mushrooms with my foods. Good job on the build Saman. 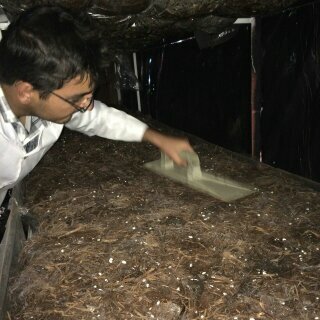 Your rooms are best place for mashroom.i prefer your rooms than my green house. because i had problem about hot weather and Setting the temperature.a large surface of greenhouse was in the front of the sun and Cooling the salon is very expensive in the summer. (i had 38c temp in summ).but it dependent on your weather. (iran is hot place). you have not any problems with 95% humidity.You need the same amount in most days.On days you do not need you can blow it off with the flow of air. If you love mushroom breeding, do it. How do you reproduce them? Do you buy spores or inoculated compost? And, what is the composition of the topsoil? I have had pretty good result growing tomatoes all winter here at 44 + degrees north latitude in the extreme NE corner of NY state 2 miles south of the Canadian border. I started these from seed a month and a half early and brought them inside. These are indeterminate Bloody Butcher. They get 2 1/2 to 3 1/2" and are pretty tasty. Anything is better than imported, hard as a rock red balls the grocers call tomatoes. I think it’s important to have already to bear plants. Starting from seed this late probably means spring tomatoes. If you have some plants still going, try to root some stems in water. Good luck. Very nice job of it all, man, I’m envious. Talk about a great job all around. I have thoughts of growing some in my cellar. 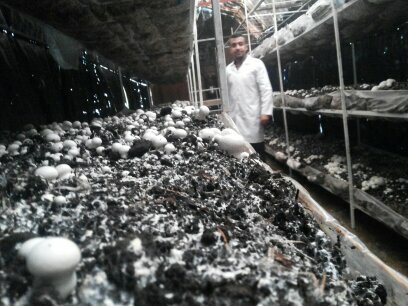 I worked in a commercial mushroom farm producing button mushrooms. The system they used was wheat straw beds about 8" deep laid in wood trays. 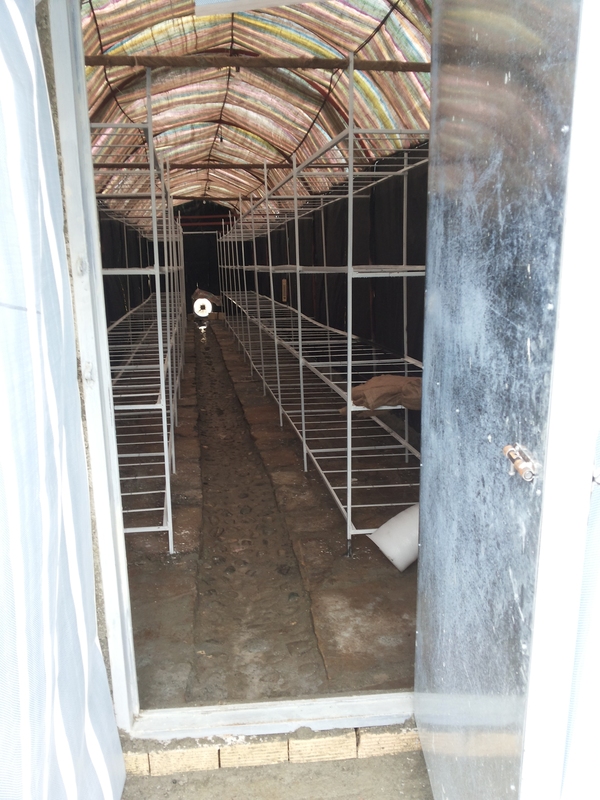 The beds would be sterilized with steam heat, then inoculated with spawn cultured on grain from sterile tissue taken from inside selected mushrooms. 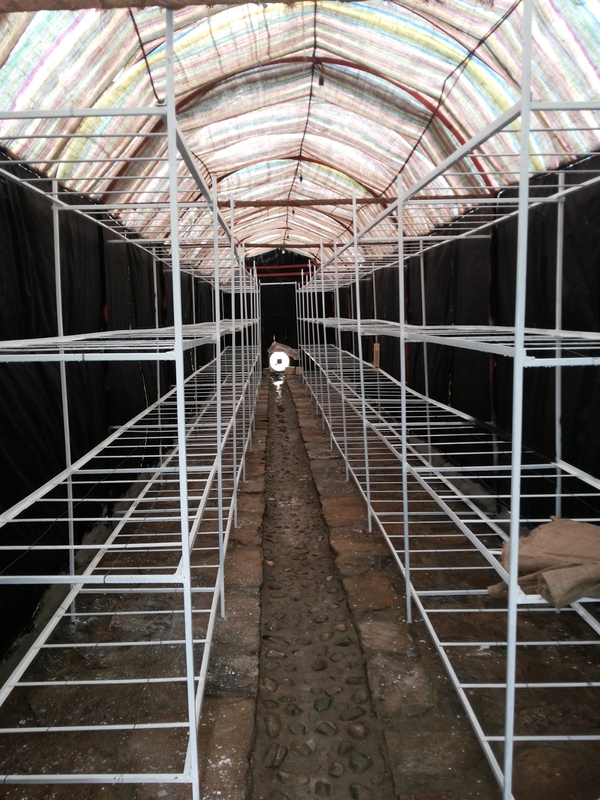 After the mycelia had properly colonized the beds, they were capped with about 2 cm of well made compost from hot compost piles, made from straw and horse stable manure. The capping and a change in temperature then would stimulate a massive development of mushrooms, completely crowded from side to side. Successive waves of mushrooms appear until the bed material is exhausted. At times the beds would be watered with a solution of calcium chloride, I’m not sure if that was for the nutritional requirements of the mushrooms, or perhaps mold control or something else. 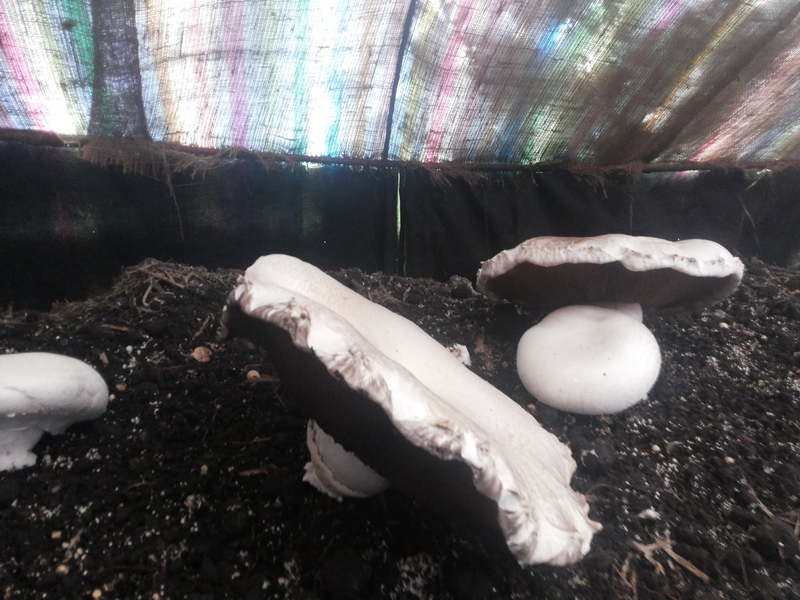 Oyster mushrooms can be grown in a similar way but on uncapped beds, or in plastic bags or tubes of shredded paper sawdust or straw with holes for the mushrooms to grow from. It is probably a good practice to arrange for ventilation or filtration to deal with spores, as they can cause lung damage over time. Ha, so the base mushroom food is in fact straw? Every sorce l read sayd they grow on compost beds with a thin line of topsoil. Its realy easy if it works like you sayd! I tryed it with mushrooms several times. Oysters on poplar logs, the snails and bugs ate the micelium before it culd sprout mushrooms. Wayted a year for nothing. The rats foun the plastic bag with straw too, destroyed that too. I bought a button mushrom kit, that was a fail. I wasn’t involved in the bed preparation, but from what I observed the beds were simply damp sterilized straw. They produced hundreds of tons per month that way, in cinder block rooms of 7 tiers of wooden frame beds, 3 stacks per room, about 150ft long. They were grown in complete darkness, button mushrooms apparently benefit from that, but oyster mushrooms required light stimulation of fluorescent lights. Preparing mycelia culture requires biological laboratory techniques, flame sterilized tools, autoclaved culture media, and a laminar flow HEPA filtered booth in order to work reliably, otherwise it will just be mold and random fungus cultured. Or commercial spawn can be obtained easily, and could be multiplied by innoculating sterile media. I have grown wild oyster mushrooms with some success by piling their preferred food here, balsam poplar, in shady spots in the forest. The trouble with outdoor mushrooms, especially oysters is that they are always infested with fly grubs that seem not slowed down by refrigeration. Rapid freezing or processing solves the problem, and the bugs taste just like mushrooms. Oysters grown outdoors seem very picky, hard to predict. They are very specific to temperatures and seem to only emerge after soaking rains. They will emerge from the same logs for several years, so don’t give up hope on your project yet. Shiitake can be grown similarly on oak logs innoculated with wooden plugs. The innoculant can be multiplied on fresh sawn oak sawdust. Do you have any pic and video from mashroom’s farm to explain more? I don’t Saman, that was 30 years ago. If I look around on the internet I should be able to find something similar. Apparently gypsum is added to the straw. 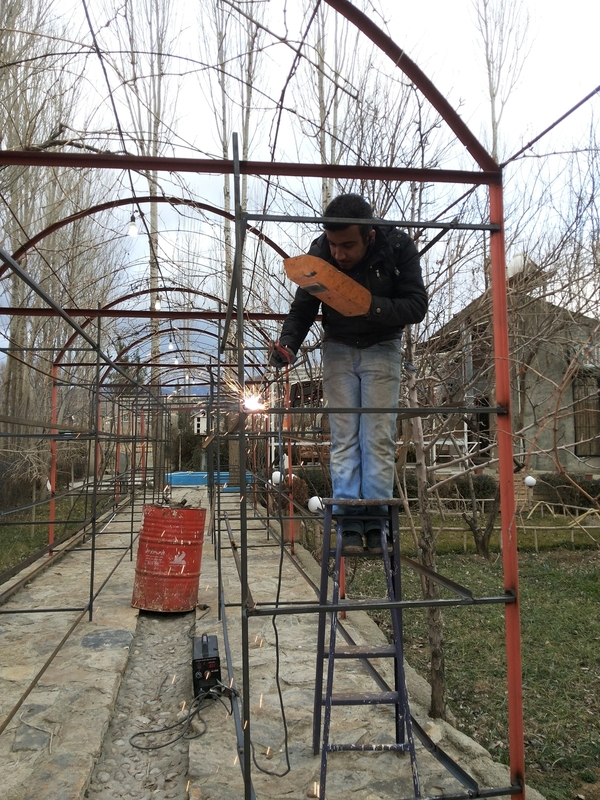 The metal bed frames are far better than the wood ones we used, but only necessary if stacking. Not directly greenhouse related, but this is what my greenhouse produces every 3 days now. My mic is bad so sorry for the sound. I wanted to show how great oak is as charcoal feedstock. The laminary grain structure produces dense, hard charcoal that allmost doesent dust when processed. I weighed the bag later, it showed 14kg so that gives a bulk density of about 150g/l, unprocessed. Update. Its s strange feeling walking from winter to summer bzt l like it! This is what the inside of the kiln looks like while operating. This is when the kiln is starting to auto-heat. And this is full blast. When the bottom lid is closed the pirolisis gas mixes better with air and produces a strong roar. The flame allso projects more verticaly heating the inner barrel more efficiantly. I will later retort chunks and thin firewood as everyday char.